Father Seamus Laverty was the beloved Pastor at Saint Patrick Catholic Church for 20 years— serving the pastoral and sacramental needs of the community until his retirement on June 30, 2015, at the tender age of 70. In his 20 years as Pastor, Fr. Seamus baptized 1,240 children, offered 1,148 First Holy Communions, led 840 Confirmations, presided over 378 weddings, performed 648 funerals and celebrated countless Masses. Fr. 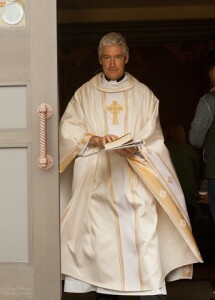 Seamus— now a Senior Priest spends time on the golf course — a much loved pastime, when he is not in prayer. From time to time he will return to St. Pat’s as a Visiting Priest, just as he did in July 2015, immediately after his retirement. It is an honor for the community to see their long time pastor celebrate Mass again and to hear him proclaim the Word; to share his wisdom in the homily encouraging all to live and share the Good News outside the church doors. Although he is no longer the Pastor of Saint Patrick Catholic Church, his welcome message to the faithful who grace the pews for Mass is still poignant and relevant. We welcome you into our spiritual family. We are truly blessed by way of a spiritually alive and enthusiastic faith-filled community. As members of the Body of Christ, we take seriously and recognize our call to worship and serve the Lord from whom all good things come. We hope you will become actively involved in the life of our community by worshipping with us and by sharing your God-given gifts with us. Together, by way of our worship and service, may we grow in appreciation of the great love God has for us all. I sincerely hope that you too experience the warmth and hospitality that I received when I first came here. Again welcome to our Saint Patrick Catholic Church community. If you have never had the pleasure of meeting Fr. Seamus’ or simply want to learn more about him, his life and his service to the St. Pat’s community, read the Question & Answer column in The News Tribune published on July 13, 2015, shortly after his retirement. Father Seamus has sung the Irish Blessing in prayer over many in the St. Pat’s community. Parishioners did the same for him at the end of his final Mass as Pastor. During his final Mass as Pastor— touching moments with parishioners were captured in snapshot by photographer Julie Ammann, a St. Pat’s parishioner who has captured many special events at the parish. She took the beautiful photos and created a video tribute in honor of Fr. Seamus’ final Mass as Pastor of Saint Patrick Catholic Church & School. This is one of many tributes honoring Father Seamus’ 20 years as Pastor. Mary Norton, a young parishioner and student at Saint Patrick Catholic School read a tribute to Father Seamus’ before his final mass with the students in early June 2015. A few short weeks later, photos collected from parishioners spanning 20 years, compiled into a video slideshow by Shea Cochran, a parishioner and shutterbug who has photographed many school events was shared with the guests at Fr. Seamus golf-themed retirement party hosted in the gym at St. Patrick Catholic School on June 20, 2015. Father Seamus will always be part of the fiber of Saint Patrick Catholic Church.